The Furniture Guild says its Avento is a new sleek, luxury freestanding vanity that celebrates the elegance of minimalism with the necessary storage for daily living. Avento, the company says, builds on the success of the company’s Avant vanity, which incorporates the same integrated finger pull in a brass finish. The Avento adds a single row of drawers and an open shelf for ample storage. Ideal for small or large baths, Avento is available in multiple configurations for single or double basins and can be ordered in sizes from 24 inches to 72 inches long. Additionally, the interior of the vanity can be customized with dividers, LED lighting, and integrated outlets as the customer requires. 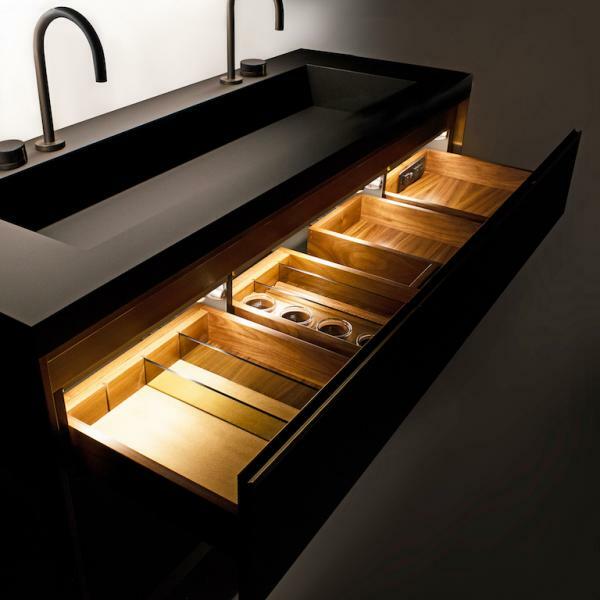 Shown here as drawer panels and a fully integrated countersink, Fenix is durable, antibacterial, resistant to abrasion, mold, and fingerprints, and uses thermal healing to remove any microscratches, the company explains. Priced from $5,000, each Avento vanity comes with a lifetime warranty and is made to order by a single craftsman, the company says. The products are made from FSC-certified hardwood and incorporate ¾-inch, pure-bond formaldehyde-free furniture grade plywood.